BED: It took us a while to find two sets of these marvellous mid-century beds and matching dressing tables, but finally we did. These high-quality, wooden items were made by Halls Lifetime Toys, who were based in Tennessee during the 1950’s-‘80s. The twin beds show all the snappy styling of the mid-century period – notice the splayed-out head and footboards for starters. 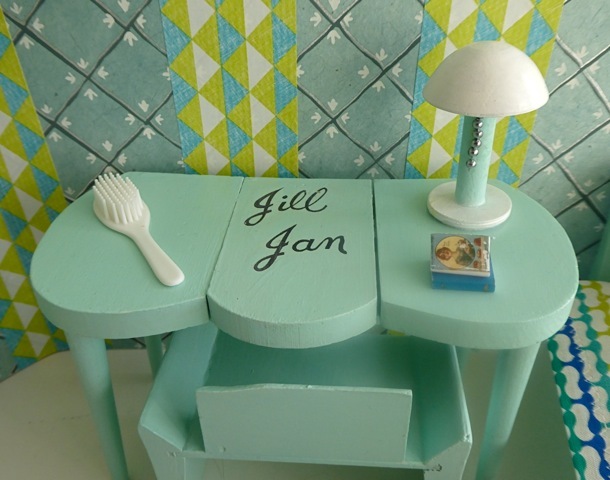 In addition, their soft aqua colour was incredibly popular at the time (we’ve matched and re-painted all this furniture), as were monogrammed items. 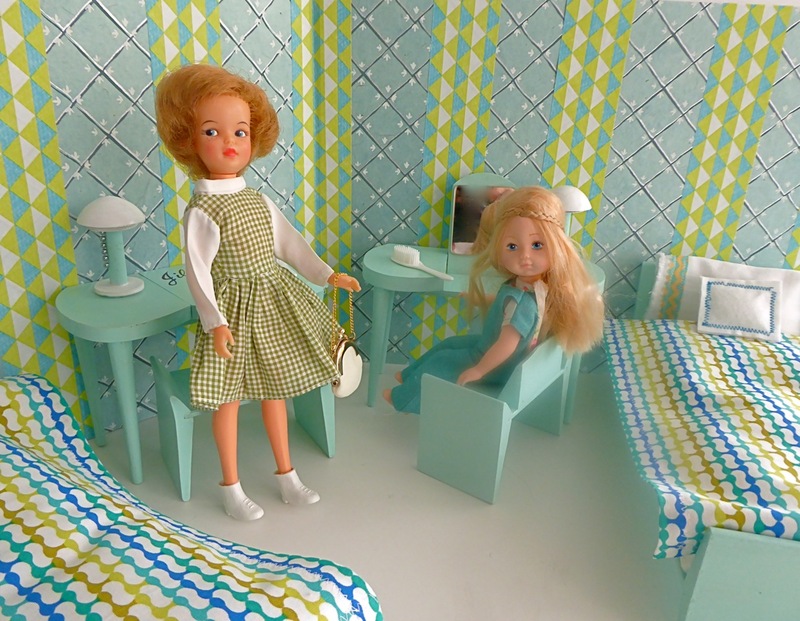 The beds were originally made for two Vogue dolls, Jill and Jan, but this bedroom set is perfect for any two dolls who want a stylish, moderne bedroom. 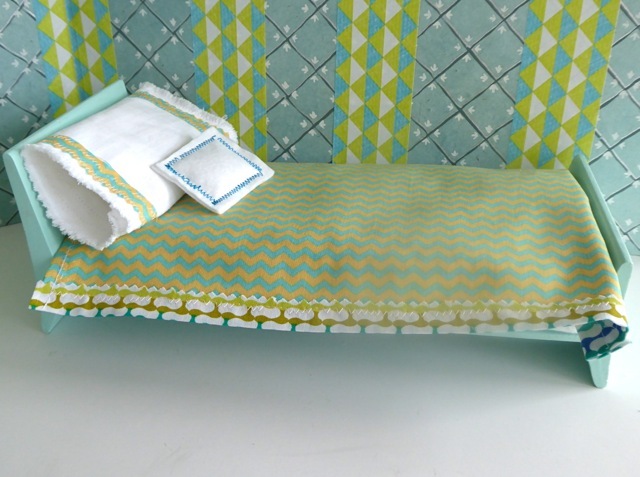 The bedding is all handmade and hand-washable and comprises a white felt covered mattress (so the beds can be used as daybeds if you like), plus a dotted duvet, reversible bedspread, pillow, pillowcase and scatter cushion for each bed. Each bed measures 10.25ins/ 26.5cm internally, and they are 5.25 ins/ 13cm wide, so this set is perfect for all 7”-10”/ 17-25cm dolls. DRESSING TABLES:Two marvellous matching dressing tables and chairs, also made by Halls during the same period, form a part of this room set. Note their incredibly clever fold-down mirrors! 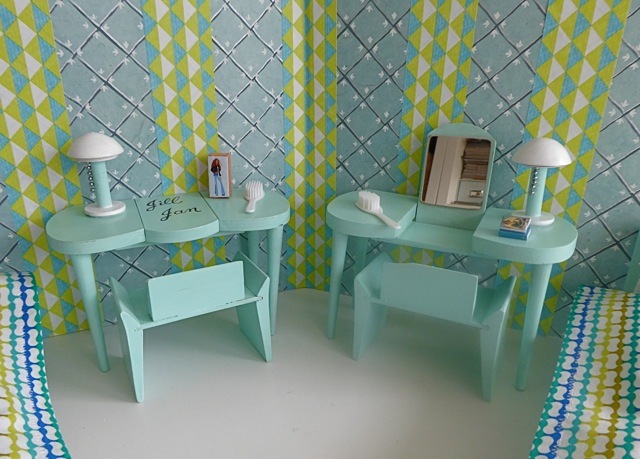 Each dressing table also holds a handmade lamp (non-working) and a white plastic hairbrush, plus a book. Please note that one chair has a small nibble out of one corner. WALLS: Covered in two delightful papers, which have been mounted on two pieces of 5mm thick A3 foam board. Each piece of foam board measures 42x29.5cm or 11 5/8 x16 3/8in. DOLLS: Chosen from our selection of vintage dolls – please see the DOLLS section this website for a greater choice. On the left, a Pepper doll wearing one of her original dresses, and on the right, a blonde Sassoon Ginny doll. Pepper makes an ideal older sister for Penny Bite or Ginny “Sassoon” dolls, or indeed any doll with painted-on eyes.